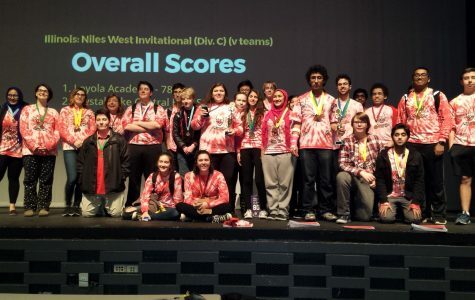 The Niles West Science Olympiad team competed on Saturday, April 21st at the state competition at the University of Illinois Urbana-Champaign. The team placed 13th out of the 24 teams in their division. The team won medals in a variety of the events: freshman Alex Thoppil and senior Christopher Rohn, second in Dynamic Planet; sophomore Zachary Werth, senior Michael Rohn, and senior Christopher Rohn, third in Experimental Design; junior Muhammad Afzal and senior Jeremy Steegmueller, third in Game On; sophomores Agata Soltys and Adrian Recinto, second in Geocaching; sophomore Daniel Cudzich and Michael Rohn, third in Thermodynamics. For Michael Rohn, placing in his events was especially important, with it being his sixth and final year of Science Olympiad with this team. Muhammad Afzal believes the team worked extremely hard and placed well based on their expectations. In Science Olympiad, it’s rare for a freshman to compete at the varsity level, and winning awards as one is even rarer. Coach Parin Patel explains his hopes for the upcoming talent next year, exemplified by freshman Alex Thoppil. According to Afzal, Science Olympiad is hoping to carry on their success this season towards next year, and possibly qualify for the national tournament.